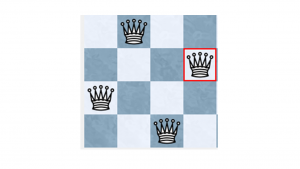 In chess, knights move accordingly to a specific rule and their placement always ends in a specific square of the chessboard. instead, it is always active, interactions do happen even outside certain squares, making very important, the understanding of all developmental tendencies of the system itself. In that complexity, for effective risk management to be present, high quantities of information are required and simultaneously we need interpret all data in a way that we can discern interactions that are not always so visible. Under those terms, risk management is not an easy task and positive outcomes rely on our ability to construct imaginative bowties. It is the ASAGA report, which states that airline pilots are facing difficulties with Go Arounds, a top event (in bowtie terms),which still has to be managed as flying into adverse weather conditions (e.g. Windshear) is a hazard that Aviation must accept. In such occasions moving on the next step of implementing a bowtie analysis we need identify scenarios or events (the threats) which could directly cause the occurrence of the top event. A survey among the pilots most probably would have spotted two occasions that directly lead to the top event release. The first one being a predictive Windshear warning on board and the second one initiating as a normal go around manoeuvre. 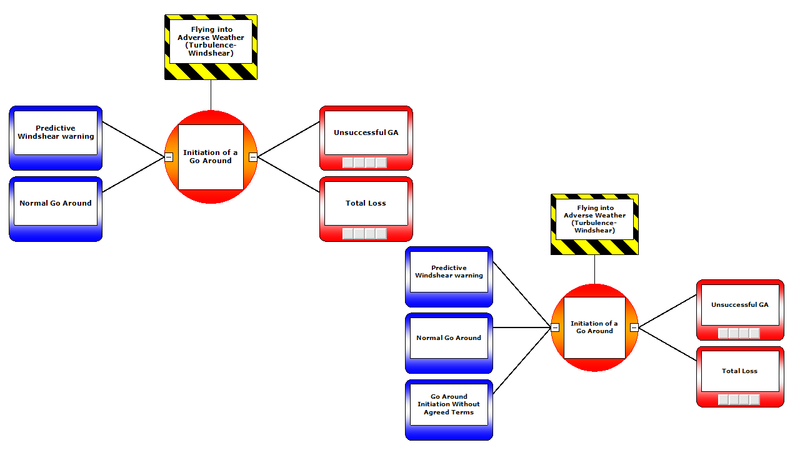 Identification of threats during a thorough risk analysis entails that each (recognised threat existing in the bowtie diagram) needs be mitigated with a number of barriers-controls. Those ideas must at least try to prevent the release of the top event, to abate it and to submit additionally emergency solutions. So where lies the problem? In situations, that real life presents a new threat, which had stayed for long time, non-visible, we are in front of a grave flaw in our safety system design. The specific flaw is a very serious one, as it exposes line operators-pilots at the sharp end of the accident, right away and leaves them without any protection. In the occasion that pilots are not certain about the exact threat they are dealing with (initiation of a Go Around with no agreed terms between pilots) and they both execute different list of actions, even for limited time, or just hesitate for longer than human factors predict, their ability to save the aircraft, is doubtful. The reason bringing pilots and the aircraft facing a severe danger is because not specific barriers might exist for dealing with the specific threat and flight crew might even lack the time for serious thinking, for devising a proper course of action. Normally, none aviation organisation expects accidents from new causes (new threats) as those when they arise are related not only to a sketchy risk analysis, but also with a limited ability into system thinking. In the undesirable situation that a flight crew cannot identify on time the threat they are dealing with, time is always ruthless. The example pinpoints the importance of issuing a system thinking at a lower level, by fully endorsing Bowtie, among line operators (the pilots), as they are always the ones who must identify threats and react. Much have been said about the Aviate-Navigate-Communicate doctrine but nobody has explained to pilots how they can overcome situations where flight cues do not specifically connect with any known expectation-danger and how Aviate rule is been challenged by that condition. For those always seeking for opportunities to cast blame on pilots, that can only exist and be associated with holes into barriers, when only pilots are responsible for them. On the contrary, when any accident is related to the “appearance” of a new cause-threat no one can blame pilots for not executing a specific list of actions when the specific list does not really exist. There comes the necessity for aviation organisations shifting their stance towards pro-activeness, keeping a part of their thinking constantly out of the box, be ready to invent new threats into their Bowtie diagrams that combine cues from different dangers.The same organisations that need very carefully describe the exact definition and the prerequisites that fully cover each threat, in a explicit way for the pilots to recognize it.Still the approach they will use to define threats needs include some additional space, for pilots to have the ability to apply their initiative and at any circumstances employ a set of barriers to deal with the threat. Bowtie then can be seen as the only learning tool into the organisation, which can put in a rational place information that currently seems useless, stays unspoken and unshared. Unfortunately, Aviation organisations or any other high-risk entity, cannot guarantee that their risk analysis is always flawless and they cannot continually foresee all possible threats, they face, during their operations. Instead, they can only hope that by training their pilots into a bowtie thinking, they can have more chances to spot unseen threats, before those become evident, after accident occurrences. Let us not forget that bowtie can be thought as a very effective solution into an inherent human problem, that of humans being unable to grasping problems which cannot be visualised. Overall, it is the bowtie methodology, which finally leads to out of the box thinking, only after someone takes for granted, that by the increased ability to constantly inventing new ideas (threats), we can only fortify the organisation’s safety management performance. Imaginative bowties are responsible, for submitting better visualisation opportunities, enhancing communication channels and ensuring creative brainstorming within the organisation.Structured thinking cannot be maintained without effective interpretation of bowties and constant information flow cannot be managed easily by other means except bowties. After all it is all about saving lives. What “Coaching” Can Do for High Risk Industries? “Coaching” is heard a lot lately, both in private discussions and into the business environment. What about applying it around high risk operations? https://www.o-diagnosis.com/wp-content/uploads/2018/02/DSC_0779-1024x685.jpg 685 1024 Dimitris Soukeras https://www.o-diagnosis.com/wp-content/uploads/2017/12/logo_sm-300x93.png Dimitris Soukeras2018-02-08 13:31:222018-03-10 08:26:42What "Coaching" Can Do for High Risk Industries? © Copyright - O-Diagnosis Design & Development by m.I.T.S.